Fu Ru Yen Shu Ji 腐乳鹽酥雞. This recipe is a delight from Taiwan, though not super healthy it's finger licking good. I have made this several times. Chicken has lovely flavour, the coating will stay crunchy for quite long time and the fried basil chips so crunchy they melt in the mouth. The recipe is easy as long as you have some fermented beancurd and some fresh basil. Here is the recipe if you like to try. about 1 cup of tapioca starch, potato starch, sweet potato starch or cornstarch. Best if you can find some granular sweet potato starch. I will show you how to make granular starch at home if you can't find it. Granular starch gives a better crunch. Cut chicken into bitesize chunks. Mash the fermented beancurd. Mix with the rest of the marinade ingredients. Leave aside for 1 hour or in the fridge for few hours. Add egg yolk to chicken. Rinse the basil leaves and shake off as much water as you can. Pat dry with dry clean towel. Mix spice salt ingredients together. Mix any starch you have with five spice powder. Then coat chicken chunks, piece by piece. Heat oil in wok till hot enough but not smoking. 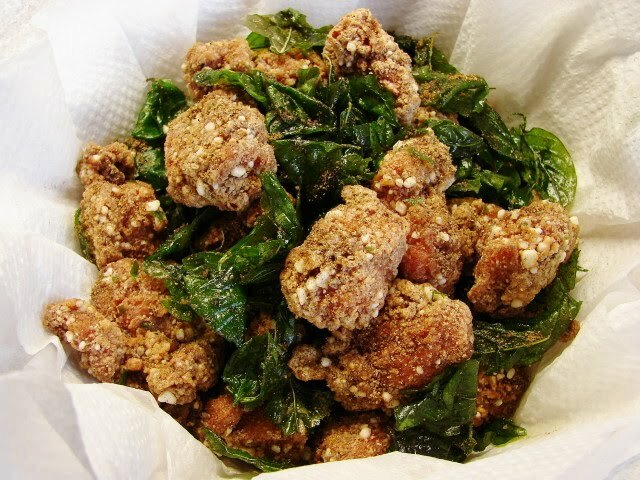 Fry coated chicken in two batches till light golden and crunchy. Remove and drain on metal sieve or a large spider skimmer. Use a small fine metal sieve, remove any loose bits of starch in the frying oil. Fry chicken pieces second time this will make them more crunchy for longer. Heat oil till very hot, drop in all the chicken pieces together. Fry at high heat till coating is crunchy then drop in basil leaves. The leaves will sizzle rapidly. fry till leaves are crunchy. Remove chicken and basil. Drain and put on several layers of paper towel to absorb excess oil. Put chicken pieces in serving dish or basket, sprinkle with spice salt. Great as a snack with chips (fries), starter or with beer. Take one cup of any starch you have at home. Tapioca and sweet potato starch is crunchier. Drizzle with water while stirring with a fork, need about 2 - 3 tbsp water. The starch will become granular but still look dry. Use the fork and break up any large lumps till the texture become fine granules. Spread this on a baking tray and leave to dry naturally for 4 - 5 hours or overnight till touch dry or fully dried. You can make more store in jar for future use. If for storing dry the granules for at least 1 day to make sure it is thoroughly dried. I think I can do this one on my one. The ingredients are so easy to find and I think it is all available in our market. I can' wait to try that recipe. Love the sound of this and love the new look to the blog too. Thank you all for your comments. These nuggets are quite unusual, I can assure they are a real treat.